These days, generally speaking, I attend one comics convention a year. The big one: San Diego. As a Boston kid in the 1970s, however, I went to one almost every month. It was an event at the Howard Johnson 57 hotel called the Sunday Funnies, organized by Don Phelps and Martin Greim. They also spearheaded New Con, a remarkable annual event which, among other things, hosted the first con appearance by Carl Barks and the only one by John Stanley. Another Sunday Funnies/New Con regular was Fred Fredericks. 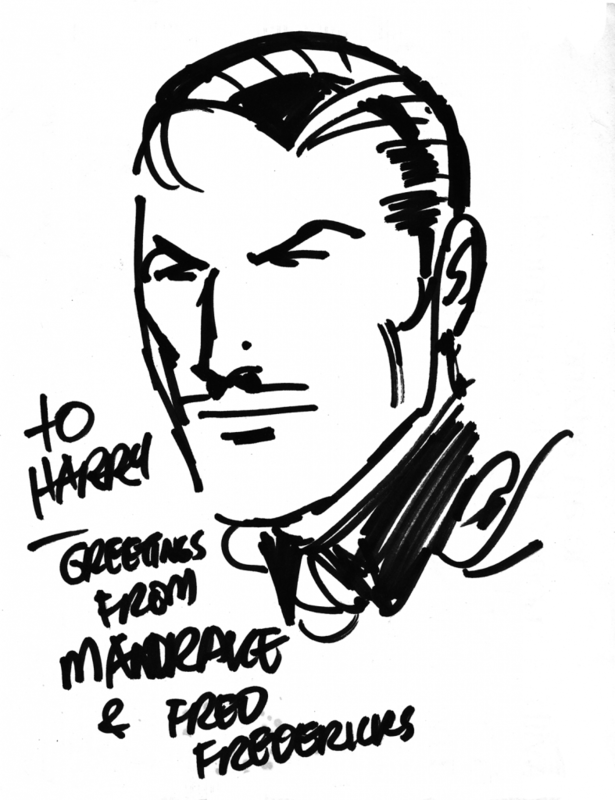 He had been drawing Mandrake the Magician–still written at the time by its creator, Lee Falk–for over a decade, and would continue to do so until 2013. He died earlier this month. It was an era when cartoonists at comics conventions were a lot more likely to do sketches for fans for free, and Fredericks was one of the most generous with his time and talent. Here’s a drawing he did for me of Mandrake, circa 1976, at either a Sunday Funnies or a New Con. Beyond Mandrake, Fredericks was a prolific comic-book artist. At another con, I asked him to draw two of the characters he’d done: Zorro and Bullwinkle. He did a charming piece of them meeting. I’m sorry to say I’m not sure what I did with that sketch, but I certainly wouldn’t have gotten rid of it, so I feel good that it will resurface eventually.